FORMER England stalwart Mark Butcher insists he fully expects Tymal Mills to shine back on the south coast this season. Mills is back where it all started with Sussex for the upcoming LV= County Championship Division One campaign as he bids to put a frustrating 2014 firmly behind him. 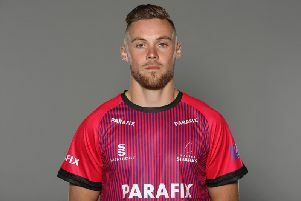 The 22-year-old only played 12 games for Essex last season owing to back problems and he took just 13 wickets at an average of 34 in his six Division Two outings. Mills has not played a competitive game since July but was drafted into the senior side’s Ashes training camp last year to provide England’s batsmen with practice against left-arm pace bowling, before travelling to Sri Lanka with the Lions in February 2014. That tour was coached by Sussex cricket manager Mark Robinson and Butcher believes the duo will pick up where they left off for this upcoming campaign. He said: “With left-arm quick bowlers being all the rage, there are a couple of those guys to watch this year. “Tymal Mills will hope to resurrect his career with a move to Sussex after the injuries he had while he was at Essex. That might rejuvenate him. “There’s a good history of left-arm seamers at Sussex with guys like Jason Lewry. Jason was never genuinely quick – he was a good manipulator of the ball and could swing it both ways, whereas Mills is genuinely fast. “I think his skill level will definitely be improved by moving to Hove – coach Mark Robinson has a great track record of getting the best out of players. “He’s got a great record of bringing in players from other counties and pushing them forward – Chris Jordan for one. And should Mills finally live up to hype, Butcher admits he would not be surprised to see the Sussex seamer lining up against Australia for this year’s Ashes. He said: “One thing with the LV= County Championship this year is knowing there is the excitement of an Ashes series coming up and that the England team is in flux. “There are still positions up for grabs throughout the team if you get off to a decent start and Mills is in and amongst that. “The thing that frustrates me a little bit with England is that we get very caught up thinking about the future. “When it comes down to it, it’s about winning games now – the future takes care of itself if you pick your best team and win now.